The iPhone 4S, officially due to arrive in consumers’ hands on Friday, has already been given a thorough test by hand-picked reviewers. What did they conclude? Let’s take a look at the word cloud. 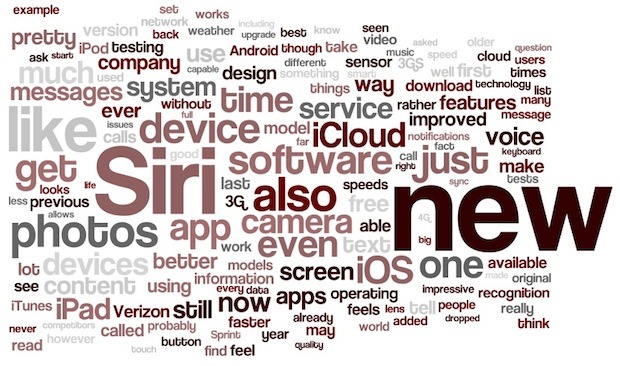 We took the reviews from some of the top folks who Apple chose to have the first look at the iPhone 4S (Josh Topolsky at ThisIsMyNext, Walt Mossberg at AllThingsD, David Pogue at The New York Times, and Stephen Fry at The Guardian) and put them to our word cloud test–after editing out the words “iPhone,” “4S,” “Apple,” “iOS” and “phone” so the more meaningful ideas popped. Siri is the voice-recognizing system that we’d previously heard was to be dubbed “Assistant,” although Apple chose to stick with the name of the company it bought to spark off this innovation. Lots of demonstration videos have popped up online, and it seems Siri does an exceptional, doubter-defeating job of understanding commands spoken casually to it in natural language (also in a British accent). It’s packed with easter eggs too, even delivering the Ultimate Answer (42) and joking about psychopathic AI HAL9000 in the movie 2001. Unlike other attempts at threading voice control through a device, it really does seem to deliver on its promises–perhaps why it popped up 59 times in the combined text. And while it also works super-smartly when you hold the phone to your ear, without the need for endless dabbing at its microphone button as shown in the video below, it does have limitations–including not being completely threaded throughout the OS yet. This means the kind of super-intelligent interactions we imagined aren’t there yet–but Apple’s noted, unusually, that this is a beta release and Siri is going to get much cleverer. “New” is the other standout word here, and its important. Skeptics bad-mouthed the 4S on its unveil as being no more than a suped-up iPhone 4 in the same case. This is actually true, with the S supposedly standing for “speed” just as in the earlier 3GS. But as Daring Fireball‘s John Gruber noted, the “naysayers are the same bunch of dummies who dismissed the iPad 2 and iPhone 3GS as well” just because the metallic tapered chassis redesign didn’t show up. These reviewers note that while it’s essentially an iPhone 4, there is a whole bunch of stuff that is indeed “new” and there’s also lots to “like.” The early performance benchmarks agree with them. One caveat here: The word “new” would almost certainly have to appear in any review of a new product, so take this with just a smidge of salt. It’s interesting that “camera” and “cameras” is only mentioned 29 times, while “photo” and “photos” show up 39 times. We’re guessing that the all-new 8-megapixel camera is so similar in installation that the reviewers didn’t want to get into its tech too much, but that they really were interested in looking at the resulting images. Positive reviews here suggest that you may consider ditching your usual “point-and-shoot” camera (3 appearances) for the iPhone 4S’s built-in one performs almost as well. Other dominant words like “iCloud,” “app,” and “software” are givens, since the faster (10 counts) performance of the phone compared to its predecessors allows for slicker apps, and the integration of iCloud to the iPhone system is an important generational leap that will change how users interact with their phones. iMessage, which we think may become a transformational app for the iPhone, was never mentioned–but that’s understandable as you have to be running iOS 5 to use it, and these guys were just the handful of users able to do so right now (ahead of tens of millions as of today’s expected launch of iOS 5). One thing you’ll note from their absence is negative words. There’s no “bad,” no “worse,” no “fail.” And instead you’ll spot “better” (14 uses), “impressive” (7 uses), and “improved” (12 uses) in the cloud. “Steve” (4) “Jobs” (5) latest baby, which outlived him, would seem to be a hit.